This cream of carrot soup is a creamy, delicious soup that is simple and dairy-free. I developed this recipe one night when I was craving something warm and comforting and realized that I had way too many carrots after recently purchasing a 5 pound bag. Dairy allergies are the most common food allergies and can cause symptoms such as skin reactions, stomach or intestinal reactions, and nose, throat, and lung reactions. Even if you are not allergic to dairy, there are many reasons to avoid milk. Unless the milk is organic, it contains all of the antibiotics and hormones fed to the cows, and sometimes genetically modified ingredients. Despite what we are taught in the media, the calcium in milk is very hard to absorb. Better sources are green leafy vegetables. Also, when milk is pasteurized, it becomes even harder to digest. If you think you might be allergic to dairy, there is a simple test you can do at home, called the pulse test. You can learn how to do it here. You could also use almond or hemp seed milk for this recipe instead of coconut milk. 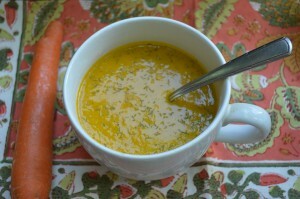 This cream of carrot with dill soup is simple, comforting and dairy-free. Steam for 35 minutes, adding more water as necessary. Add the chicken broth, dill salt and pepper. Steam for an additonal 10 minutes. Place everything in a Vitamix or blender. Garnish with a little extra dill.